The ORBITEC large part machining centers provide the capability to create true turned surfaces on parts that difficult, or too large, to rotate. 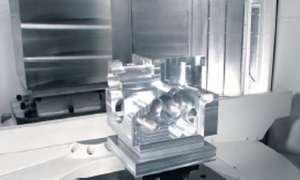 The machines greatly reduce setup times and improve throughput for large, heavy and awkward workpieces such those often found in the energy industry. 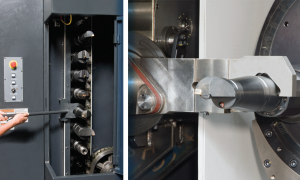 As a cost-effective, innovative valve body production center ORBITEC machines can complete more than 75% of valve applications in one setup while maintaining high tolerances. 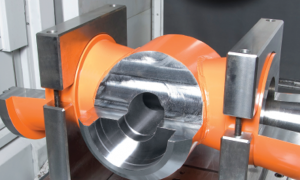 The patented head-design technology in ORBITEC machines allow them to perform a variety of operations, including the facing of flange surfaces, conical boring of taper holes, face milling and endmilling, in a single part setups. The machine’s head allows the centerline of rotation to be moved for positioning the turning centerline where needed. The unique Mazak-patented headstock design of the ORBITEC 20 effectively generates turned features on large parts by keeping the workpiece clamped and stationary, moving only the cutting tool. As an internally counter balanced system, the ORBITEC 20’s headstock keeps tool tips facing either toward or away from the centerline of rotation while tools orbit around workpieces. This provides stable precision machining and less part interference because tools do not protrude beyond the rotating headstock when working on larger diameters. The ORBITEC 20’s versatility stems from the wide range of motion of its axes, which allows the headstock to easily maneuver around large, odd-shaped workpieces. 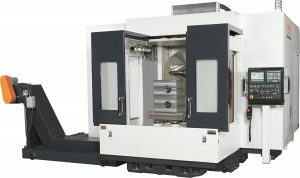 All the while, the NC rotary table provides high positioning accuracy and repeatability, as well as boosts accessibility by locating a square machining center pallet to provide 360º to large parts. The ORBITEC 20 provides continuous processing through a standard ATC magazine that accommodates Capto-style tooling and stores up to 60 tools with maximum diameters of 125 mm (4.92″) (250 mm (9.84″) if adjacent tool pockets are empty) and maximum tool weight of 20 kg (44.09 lbs). From the gauge line, the ATC accommodates maximum tool lengths of 500 mm (19.69″). Additionally, the ATC magazine indexes to one pocket in 0.8 seconds and 30 pockets in 10 seconds.